This entry was posted in #amwriting, #writetip, writing techniques and tagged genre fiction, Joe Moore, series, standalone by Joe Moore. Bookmark the permalink. I think a lot of this choice depends on the genre. My cozy readers love series. So do paranormal romance fans. I’ve done a series and stand-alones in scifi romance. I find that I get better mileage out of series, because once you hook the reader, they’re yours. But stand-alones do allow you to experiment and try something totally different. With book box sets being all the rage, think of tying a few of them together with a common theme and bundling. Nancy, I’ve read your series and standalones, and you’re excellent at both. I know that John D. MacDonald, who wrote masterful stand alones, found his pot o’ gold in that long-running series featuring Travis McGee. If putting steak and champagne on the table is the motivation, then series writing is probably the way to go. But I also have a bunch of stand alone concepts crying to get out. The nice thing about indie publishing is I can do whatever the heck I want to. So I’m trying to follow Isaac Asimov’s advice, when he was asked what he would do if he knew he had just six months left to life: Type faster. You’re right, Jim. Writers have to prioritize what helps bring in a paycheck. Still, we all get that urge to venture into unknown territory now and then just to quench our thirst. Great question! And one I’ve been over analyzing as a writer recently. I write series, but I love reading stand alones, so, like Mr. Bell above, I’m considering some stand alone novels in my future. Heather, thanks for stopping by TKZ and sharing your experiences and comments. When your fans email you with demands, that’s a great problem to have. As a reader I haven’t found too many series that draw me in. I prefer big, high velocity thrillers that tie everything up at the end. (“Potboilers,” as Kris called them in her post yesterday.) I eagerly read anything new by an author I like, but I don’t look for more of the same story. I want him or her to give me a brand new story, new characters and new ideas, each time. A brand new story with new characters and new ideas can be tough if a writer only pumps out standalones. One stumble can be costly. Most of my favorite authors mix it up. Of course there are exceptions. No matter what, it has to be a great story first. I LOVE LOVE LOVE series. I fall in love with a character and can’t wait to see what they’re up to in the next book. (And I’ll note here that in romance, “series” doesn’t really mean “series” but rather books that connect to each other with repeating characters, but different protagonists in each.) In mysteries, it’s usually the same protagonist, and readers can watch the growth of the character, of relationships, and it’s like visiting a friend. Most of the mysteries on my bookshelves are series. But yes, for the author, it means keeping things fresh and moving forward, and I SO hear you on handling back story. I don’t like to step into the middle of a series. I want to follow along from day 1. And when I’m writing my mystery series, I want my readers to be able to read book 4 without it spoiling the first 3 books, all the while offering “insider” moments to readers who’ve read the others. Sometimes the captcha doesn’t add up, 🙂 Terry. Thanks for putting up with it and sharing your thoughts with us. Joe, you set out clearly the pros and cons of “standalones” versus “series” in your excellent post. Like James Scott Bell I write both. With my crime series, readers say things to me like, “Tom, tell me more about your cop character Matt Proctor in your next novel “, or “I find Azzra Mukherjee an intriguing character full of contradictions – let’s see more of her’. Standalones? With “Sarcophagus”, my feedback includes comments like, “…a fascinating insight into the post Chernobyl devastated and toxic landscape”. As a writer, yes, I like to revisit my “old friends” in my crime series but boy! the thrill of heading into the unknown once more, staking out new territory, meeting “new friends”, introducing and sharing them with my readers. I believe mixing standalones with a series helps keep your writing fresh and avoids the potential to become stale; even, Heaven forbid – boring. Totally agree, Tom. Thanks so much for dropping by TKZ. My first book was a standalone, a coming-of-age story about a young lady runner. The second, more action/adventure for young ladies, was also a standalone. The problem with standalones for writers, as much as I like them both as a reader and writer, is that there is no immediate sales hook into the next book. My current work is the first in a series, but also a different genre, one that expects series. The current plan is to finish the first book by the end of summer, and have a great start on the second while I shop the series concept. If I don’t have takers by the time the writing is complete, I’ll head to the indie side with it. In the meantime, like Jim, I have standalones begging to be written, so I’ll work on two different books at the same time. Plus another non-fiction book that I’ll shuffle in when the opportunity presents itself. Now, excuse me while I go follow Asimov’s advice and type faster. Paul, sounds like you’re not afraid to experiment. Good luck placing book one in your new series. As others have said, really interesting article and a great overview of the pros and cons. But I do sometimes read standalone fiction if it’s by an author I like or the idea grabs my attention, and some of those can really stick in your memories. This is possibly partly because that is often the only story with those characters, so once you finish you know that is it. There can also be greater tension and a heightened sense of danger than you might get in a series, because while we all know they’re never going to kill off James Bond or Indiana Jones, you can’t really say the same for Joe Smith who is only in this novel. But for me the answer to the original question, which type should you write, is whichever one you want to write. Or both. Oh and I love seeing characters crossover from different series when it fits the story. Simon Kernick’s Siege is really a standalone novel, but has a familiar face from one of his series turn up when you least expect it. And as I read James Rollins, Steve Berry and Brad Thor’s series, having characters from all three pop up in each other’s novels at one point was fun too. I agree, Matthew. 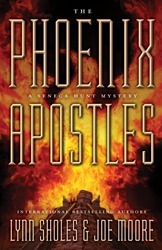 Boyd’s thrillers are terrific. We miss him. Now he’s off co-writing books with some guy named Clive Cussler. Thanks, Joe, for another excellent article. I love series, both as a reader and aspiring author. As a reader, I am probably the author’s dream reader, because if I find a series that interests me, I feel compelled to start at Book 1, even if each book in the series can be read as a standalone. I like to revisit favorite characters. I am planning a series and working on the first book. I also like books that revisit a setting, but have different characters, like Stephen King does with various characters in Derry, Maine. Thanks for all your help, it is appreciated. Glad to be of help, Rebecca. And we appreciate you stopping by TKZ. I write stand alones that are set in the same town with some characters following from one book to the other. Always a new hero/heroine, though. Great post. Thanks for sharing your experiences, Patricia.